The Syracuse football team (3-4, 1-2) gave the No. 25 Pittsburgh Panthers (6-1, 4-0) all they could handle, but fell just short with the end result being the same as their previous three contests. The Panthers kicked a last-second field goal to defeat the Orange 23-20. 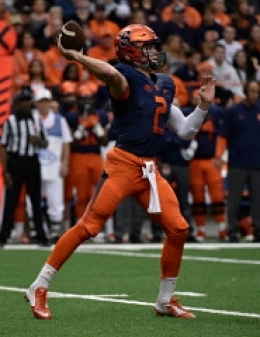 Quarterback Eric Dungey set to throw a pass. Saturday’s homecoming game marked the Orange’s fourth straight defeat, and their second consecutive last-second loss a week after losing to the Virginia Cavaliers (2-4, 1-1) in triple overtime 44-38. While he was pleased with his team’s effort, head coach Scott Shafer was obviously upset over back-to-back heartbreaking defeats. “We’d like to finish with exciting wins, not exciting losses,” Shafer said after the game. The Panthers’ 19-play, 89-yard final drive culminated in a 25-yard field goal by kicker Chris Blewitt. The Panthers converted third down after third down on the drive, as the Syracuse defense simply couldn’t get off the field. The Panthers were even able to convert a fake punt on a fourth down in their own territory, something the Orange have proven adept at this season. While the defense certainly played better as a whole than they did in its last effort, the inability to come up big when it mattered most doomed the Orange. “It’s finishing those drives on defense and getting the offense the ball back,” Shafer said. Syracuse’s offense was very effective in the first half, putting 17 points on the board. Jordan Fredericks exploded for a 55-yard run on the Orange’s first play from scrimmage, sending a jolt of energy through the Carrier Dome. On the very next play, Ervin Philips caught at 20-yard touchdown pass from quarterback Eric Dungey that had the Orange faithful rocking. After a Cole Murphy field goal made it 10-3, Pittsburgh running-back Qadree Ollison scored on a 2-yard run to level things at 10-10. Syracuse responded in kind on the next possession, with Dungey finding wide-receiver Steve Ishmael for a 4-yard score to make it 17-10. Ishmael had his best game in an Orange uniform, catching seven passes for a career-high 114 yards. Several of those catches were of the spectacular variety; Ishmael consistently won one-on-one matchups against Pitt’s secondary, using his athleticism to outmaneuver defenders. The Orange entered halftime with a 17-13 lead. However, the offense struggled mightily in the second half, coming up with just a single field goal the rest of the way. Back-to-back Syracuse drives in the third quarter ended in interceptions, killing any momentum the offense might have been building. The first one came on a tipped ball that was picked off by Pitt linebacker Matt Galambos. Dungey let loose an awkward-looking throw that found its way into the defender’s hands. When the Orange got the ball back, Dungey was looking for a big play, eyeing one of his receivers deep down the field. But an under-thrown ball was picked off by the Panthers’ Lafayette Pitts, ending the Orange drive before it ever got started. After the game, Dungey took full responsibility and admitted that he needs to cut down his mistakes. Despite those offensive struggles, the Orange remained in the ballgame until the bitter end. Neither side played particularly well in a sloppy and scoreless third quarter. 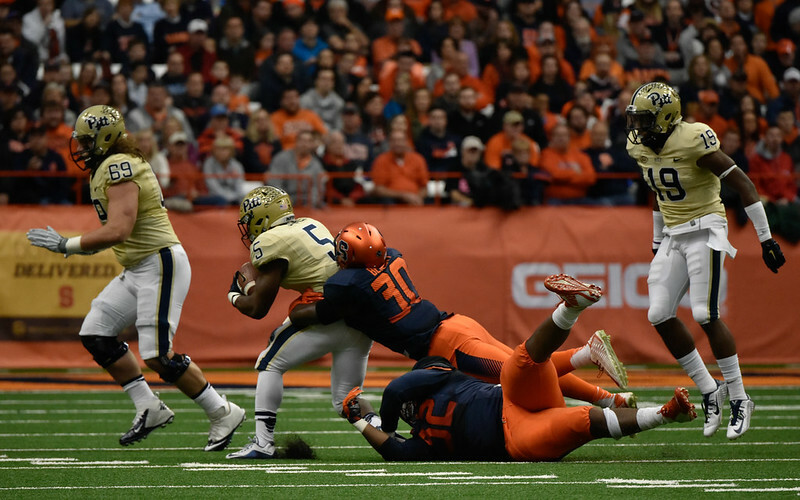 Pitt was able to take the lead early in the fourth quarter on another short touchdown run by Ollison, whose numerous short runs slowly chipped away at the Orange’s run defense. Syracuse was able to tie the game on a 37-yard field goal by Murphy. But the offense never got another chance to see the field due to the defense’s inability to stop the Panthers’ run game on third and short opportunities on the long, arduous final drive. While the Orange are currently in the midst of a four-game losing streak, Shafer is proud with how tough his young team is playing, declaring that he is disappointed but not discouraged. You have to wonder, though, how long the discouragement can be held at bay if the Orange suffer another crushing defeat. Things only get tougher for Syracuse from here, as next week they have to head down to Tallahassee, FL to face the Florida State Seminoles (6-0, 4-0), a squad that came into this weekend ranked No. 9 in the country. That contest can be viewed on ABC at 12:00 p.m.